The memories of my childhood’s summers are dotted with ice candy, ice scramble and buko juice. Among these favorites though, it’s buko juice that remains to be a staple. And why not? With its light sweetness and refreshing flavor, it’s something to be enjoyed regardless of season. Fortunately for us, a kindly old manong drops by with his buko cart during the weekends so we can get our buko juice fill. You tell him how many you want to buy, hand over a pitcher, then he splits the young coconuts for you. Afterwards, he spoons the young, tender flesh off the shells, letting it slither into the pitcher waiting with coconut water. You can choose to drink it directly or stick it in the fridge for an even more refreshing drink. In our case, we cut it with a small amount of water and add a little sugar. We usually fish the flesh out of the pitcher too, and slice it into thin strips so it slithers between your lips with each sip. Divine. Served cold from the fridge, heavenly. Years from now, I know I’ll still be loving buko juice. And if you’ve tried some yourself, I’m sure you’d understand why. 1. Slice the coconut meat into thin strips. 2. Mix together coconut water, plain water, and sugar. Add the coconut meat. 3. Chill. Serve really cold. This entry was posted in food shopping, food spotlight, recipes. Bookmark the permalink. I adore your blog! I love that every dish has a story, and your bento is beautiful. Wow, I can’t believe you get ‘authentic’ buko juice in your village! ^_^ The photos add a nice touch. 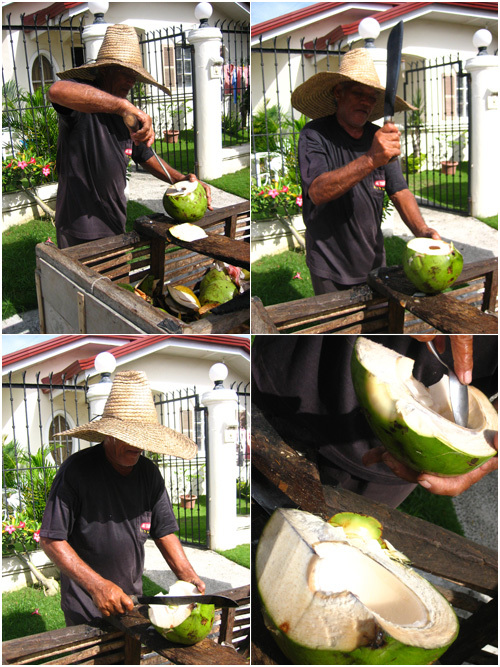 I miss fresh buko juice! You are so lucky to have it delivered right at your front door. I’d never heard of buko juice before. Sounds delicious! And your light, tropical pictures are an oasis on this dreary day. ;0) Thanks for sharing! Thanks! It really has been dreary lately, even here in the tropics. 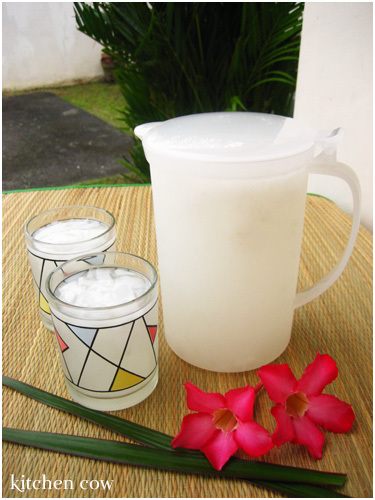 Buko juice is also called coconut water in some places. 😀 It’s basically the water found inside a coconut—not to be confused with coconut milk. Oooh, you’re lucky! Fresh food all around! Not to mention fresh air and everything. I wonder, will steeping fresh pandan leaves also work or does it really need to be heated? Because I imagine putting fresh pandan leaves directly in the buko juice would deepen the flavor even more. Wow looking on that buko juice photo made me miss it so much. I haven’t drink a fresh one since I got here in Australia. Buko juice in Philippines is just so refreshing. Such a pity! I know of a brand that bottles buko juice and it’s fairly good. It’s called Lipa, but I’ve no idea about their availability outside the country. The bottled ones (in PETs) are decent to good. The canned ones, I stay away from though. It has a faint tinny taste that I don’t like. And yay, they have a website! Ooooh…not really that much of a fan of buko juice, but it is nice to have a glass during a hot summer day. In our case since we have coconut trees in our backyard, someone climbs a tree for us, get a few, and then our maids slice and scoop it up for everyone to enjoy. I just discovered your blog today and I just can’t leave my computer. I recently got married and have absolutely no talent in the kitchen (except for lucky me products), but your blog has given me hope. Haha! This is my favorite entry..because I love buko juice and we also have a similar looking old manong that supplies us with a fresh piece everyday. I just prefer it with a little more meat. Something that I love having during the summer is the buko sundae. Thinly sliced coconut meat topped with chocolate ice cream and rice crispies (or whatever you prefer to put on top). A lot of people consider it yucky, but it tastes really good I promise. thank you very because i finish my project…??????????????????????????????????????????????????? ?